SRA Home Products is proud to install pergolas at homes in the King of Prussia, Pennsylvania, area. These products are the ideal outdoor living structure for many homeowners because they boast countless stylish and functional benefits. For example, the pergolas we install not only provide a shady place to relax on a hot summer day, they also bring a unique charm to homes thanks to their Mediterranean-inspired design. 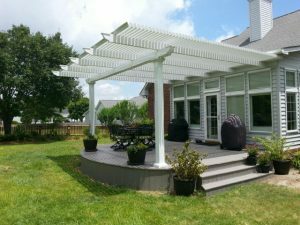 No matter where you intend to place your pergola – be it over your patio, as an entryway to your garden, or elsewhere – this stunning product will surely make you the envy of your neighborhood. Appearance – Our pergolas feature an innovative snap-fit design, which eliminates the need to use ugly screws that would detract from your structure’s appearance. Durability – Made with heavy-duty extruded aluminum – which is one of the strongest materials on the market – our pergolas can withstand years of weather exposure without rotting, warping, chipping, or cracking. Customizability – In addition to customizing your pergola’s size, you can also select from several elegant column styles – which are available in either white or sandstone – to ensure your structure meets your aesthetic preferences. Perhaps best of all, every pergola we install is protected by TEMO’s lifetime limited transferable warranty, so you can relax knowing you have made a sound investment. To learn more about the benefits of the pergolas we install for homeowners in King of Prussia, PA, contact SRA Home Products today. When you do, be sure to ask about the financing options we offer to help make your addition more affordable.